On Tuesday, the news came out that Brett Favre was coming out of retirement yet again, and heading to the Minnesota Vikings. 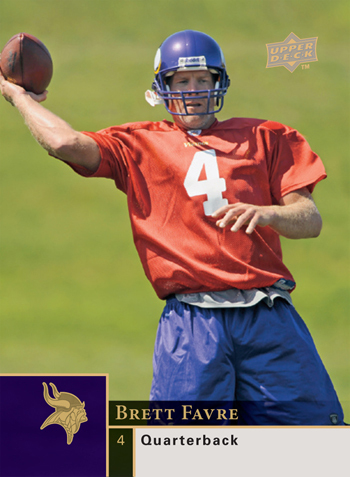 Today is Friday, and we’ve got a 2009 Brett Favre card lined up. And yes, it includes purple. If you saw the Catching Up With Collecting piece featuring Gary Tolle from a few weeks back, you know that Upper Deck has teams of photographers and internal resources ready to hustle when a big trade or signing goes down. This week was no different. 2009 NFL SPx will come out on 9/15 (less than a month from now), but this card will be in there. Great news for collectors . . . though if you live in Green Bay, we’re sure you feel differently. Thank you for not using the press conference photos! Man, what a relief.